We went to the Nature Park again today. 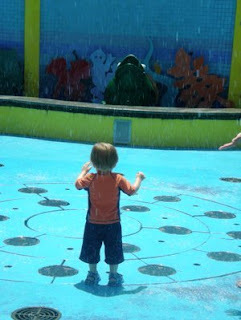 The toddler had some more water fun. 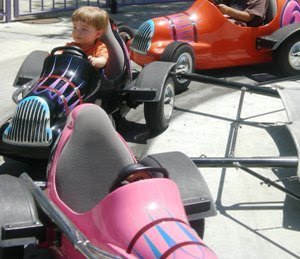 He also rode a car all by himself for the first time! 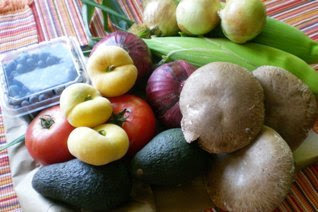 On the way home, we stopped by the organic farm and got some more fruits and veggies as well as portobello mushrooms. Then, I grilled them for 3-5 minutes on each side (I didn't really time myself...) and when they were almost done, I added some cheese and let the cheese melt. In the meantime, I toasted some bread and spread some avocado on it and put on some greens and heirloom tomatoes before adding the mushrooms. Tuesday: Inspiration from the blog world: Bella’s Vegetarian Enchiladas and a salad. Wednesday: Summer Salad with fresh corn from the organic farm. Friday: Spinach salad with avocado dressing & grilled shrimp. Question: What meals do you have planned for this week? Please share! I'm so excited to cook!! we're supposed to have them planned?! Yum- I love trying out all the recipes I found in the blog world! (I'm a sucker for pictures of food) This week I'm sticking to a particular diet (protein at every meal, only 1 carb at lunch, and unlimited vegetables!) So I'm trying to find some good recipes to spice up my veggies this week! Any suggestions? that kiddie is soooo cute! i love pictures of fresh produce - is that weird they make me happy? i need to start planning meals ahead like you. unfortunately, im heading out of town this weekend so its more use up whatever I have this week. next week, back to the basics! He is too cute in these pics! Love the mushroom burger... looks amazing! I'll have to try portobellos now! Everyone tells me they are great in place of meat because they have that meaty texture, but I have never tried them. Your burger looks great! Looks like a fun day. And the burger looks yummy! I thought of you today when I picked up some more portobellos at the grocery store, your burger looks totally yummy! Love your weekly meal ideas! You are an inspiration! Wow; your mushroom burger looks so yummy...looks like your week is going to be delicious!!! 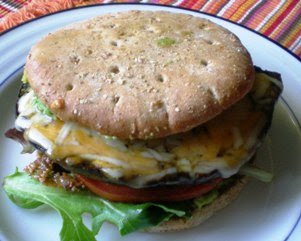 Yum, that portobello burger sounds amazing! I'm going to have to pick some of those up. What a wonderful idea..I love Portobello Mushrooms!